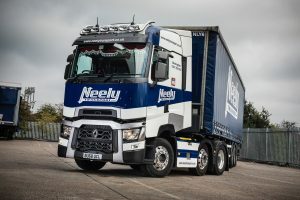 Following a thriving 20-plus year relationship with Renault Trucks dealer Allports Group, Birmingham-based warehousing, distribution and transport specialist, Neely Transport, has chosen the Range T High as its flagship vehicle. The 13-litre T520 High 6×2, the first of its kind on the 25-strong Neely fleet, is being deployed alongside 12 other tractor units on its UK-wide trunking and general haulage operations. Coupled to a tri-axle curtainsider trailer, no expense has been spared, with the high-spec truck packed with optional extras including four-camera recording system, Kuda light bar, extended catwalk, alloy wheels, side air deflectors and hazardous chemicals ADR kit. The truck’s distinctive blue and white livery is designed by Allports Signtek, finance is through Renault Trucks Financial Services and a comprehensive four-year Renault Start and Drive Excellence Repair and Maintenance agreement ensures that the entire vehicle is maintained in outstanding condition with Renault parts, for ultimate peace of mind. After an initial two week trial, where both T High performance and driver acceptance were evaluated, the Neely team were won over: “We put a T High through its paces for a couple of weeks and we really liked the look of it; both visually and performance-wise it was top notch,” explains Clive.